I wanted something unique to take to the field. This autogyro fit the bill. 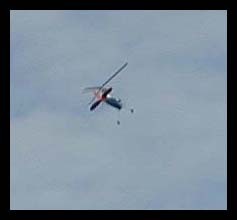 Autogyros are a rare sight on our fields; so much so that many people don't know what they are, or how they work. Several people were overheard to say that it is a ridiculous thing, and couldn't possibly fly. Perfect! The fuselage is a standard LazyBee from Clancy Aviation. The entire kit, including the rotor assembly is supplied by the Autogyro Company of Arizona. The kit was well documented, and the wood was perfect. I put the fuselage together, and let it sit for a year, or so. 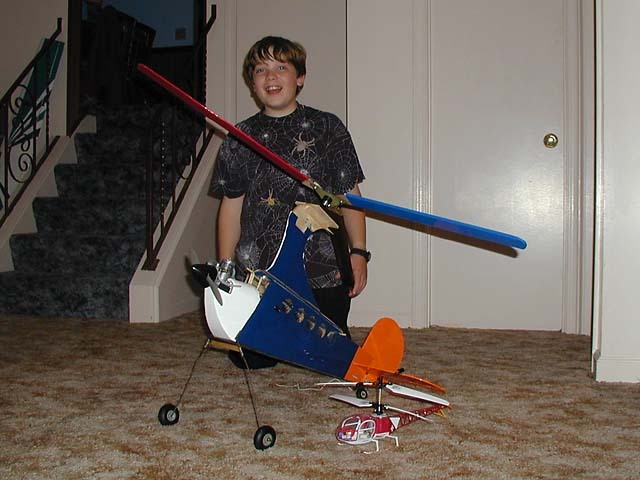 Steven decided he wanted it finished, so he installed the servos, pushrods, control horns, and rotor head. I've heard how hard balancing the rotors are, and was concerned about it. It turned out to be easy. Ray Stacy helped me out using his scale and helicopter blade balancer. Once each blade was statically balanced, it was done. We took it to the field on November 15, 2003. The wind was less than 5 mph. Eric took the controls. I walked it into the wind to build rotor speed. When it felt neutral, I gently tossed it. I don't think the rotor was up to full speed, and the Magnum .25 wasn't pulling that hard. It slowly came down. When it did, the rotor hit the rudder, and broke it. 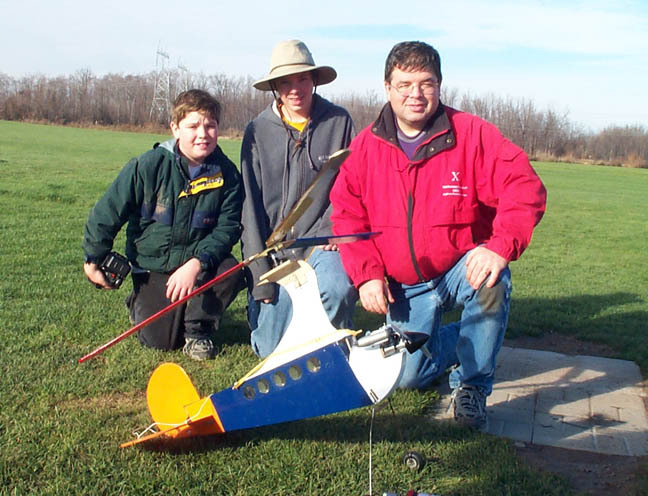 I changed the prop from a 9x5 to a 10x4, fixed the rudder and took it back to the field on November 22, 2003. Ray, having autogyro experience, agreed to be the test pilot. We tried a couple of ground take offs, but the landing gear was too close together and it kept tipping over. We decided to hand launch -- which is what the manufacture recommends for the first several flights. Success! Well, mostly. We had a nice 2.5 minute flight followed by a hard landing. A couple of things need to be changed. First, the Magnum .25 provides only marginal power. This is going to be replaced with an old SuperTigre .40. Remember, even though the rotor is not mechanically connected to the motor, it is still the motor's power that turns the rotor. Second, the landing gear has been re-bent to give it a wider stance. Third, the rudder has been reformed so that it is shorter (out of the path of the rotor) and longer. So, how does it work? The blades have a small amount of negative pitch. The rotor is spun up using the breeze, or by moving the autogyro into the wind. Once the rotor is up to speed, the rotor disk acts like a wing. 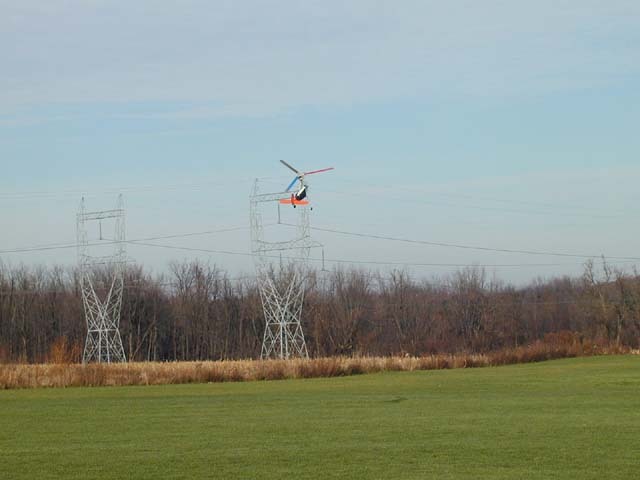 Because there is no torque, a helicopter tail rotor is not required. There are several different designs for autogyro rotor heads. On this one, the blades are held at a fixed pitch, but the rotor head tilts from side to side. This gives aileron-like control, and allows the pilot to compensate for the pendulum effect seen on other designs. A unique characteristic of autogyros is that they cannot stall, and therefore can fly very slowly. When the aircraft pitches up, more air moves through the rotor, which increases the rotational speed. It then generates more lift, but also more drag. To maintain this high attitude, the motor must produce more thrust. Pitch and climb is controlled through a combination of throttle and elevator control -- much like an airplane, but even more so in an autogyro.